In July 2015, Telstra Corporation Ltd shares were trading at $6.50. Today, those same shares have lost more than half their value and trade at $2.82. In three years, Telstra has seen a devastating slide in revenue – but it’s not just Telstra that is feeling the pinch. Other telcos are finding it difficult to flourish in the current market as well. Vocus Group, who offer products through brands such as iPrimus and Dodo, witnessed a massive 30% decline in their shares over the past year. Telstra have to fight to stay on top, and they’re not taking it lightly. For example, in recent plans to restructure, Telstra announced their intentions to terminate the employment of around 25% of their staff in order to streamline the company. The CEO justified the decision, saying that they have to make decisions that are in line with the long term goals of the company. To combat the predicted fall of 2-3% in the telecommunications market overall revenue next year, Telstra released their “Telstra 2022” plan, which outlines the steps the company plans to take to get out of the downward spiral of decreasing revenues. In their new Telstra 2022 plan, they intend to get rid of legacy products and structures, even if they have to bear the immediate cost of doing so. It’s a risky move, as some experts are predicting the plans will translate into a loss of $500 million in revenue over the next three years, along with another $600 million in additional restructuring costs. However, with 5G just around the corner things might soon change for the telecommunication industry of Australia. While 3G and 4G certainly provided benefits to its customers, 5G comes at a fortuitous time for the telecommunications industry. As a huge number of research projects are focused on turning the Internet of Things from a concept into a reality, it has become more obvious that the current mobile broadband is not sufficient to support the functions that these new devices will need to have. 5G provides the “next big thing”, and as a global leader in 5G implementation, Telstra are well placed to reap the benefits of the latest technology. What does 5G bring to the table? Telstra is now focusing on retaining customers so they can reap the benefits when the 5G technology is in place. The telecom industry has witnessed a trend where the launch of each new generation of communication is followed by the customers trying to reap in the benefits of better speed and performance. This in turn led to industry wide growth in the telecommunications market. With Telstra’s significant investment in 5G technology, their extensively publicised trials, and their “smart home” products, the popularity of 5G will undoubtedly attract new customers to Telstra. Telstra has always been at the forefront when it comes to introducing new technology to the public. It was first to launch the 4G services in Australia, almost a year before Optus partnered with Huawei to bring the technology to its subscribers. Interestingly, by hyping their coming 5G capabilities, Telstra may have slowed their own growth. Research by Telstyle suggests that people might be deliberately delaying smartphone upgrades in 2018 in order to buy a phone that is 5G compatible when they become available. Overall smartphone sales in Australia witnessed a decline of 3.7% compared to the same period last year. Experts think that people are waiting for the new technology to fall into place, in order to buy newer smartphones that are compatible with 5G. This makes sense in order to avoid buying a premium smartphone now, only to see it becoming obsolete in the coming months. Telstra has also announced $1 billion in cost reductions by 2022 – making the total reductions $2.5 billion since after 2016. Telstra has implemented Artificial Intelligence (AI) to streamline its operations and save the costs of manual labour. Additionally, it has encouraged its customers to use self services which have contributed to a steep decline in the number of calls. It is evident from these measures that Telstra are aggressively reducing their operational costs in order to save money, and now the focus will be on increasing sales. Telstra has already demonstrated 5G technology at several events to showcase its dominance in the Australian telecommunications market. 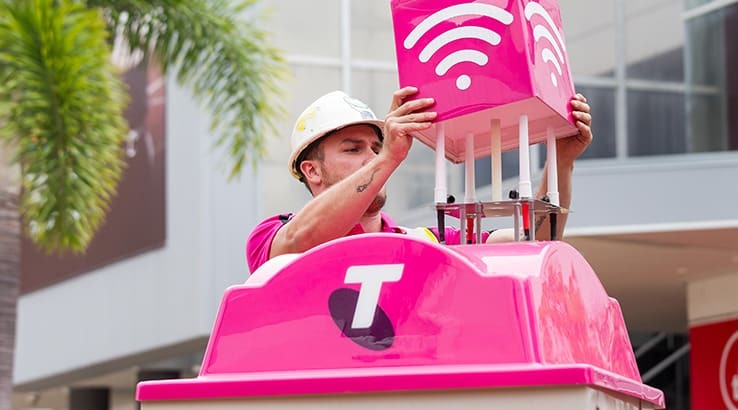 While Telstra might have temporarily shot themselves in the foot by hyping 5G, it remains to be seen whether it will be a good move in the longer term.